So awhile ago, I looked in my collection and realized I didn't own a really good silver linear holo. That's kinda crazy, since silver is one of the most common colors for linear holos. I was making an ILNP order at the time, so I decided this was justification for adding I Love Nail Polish Mega to my order. 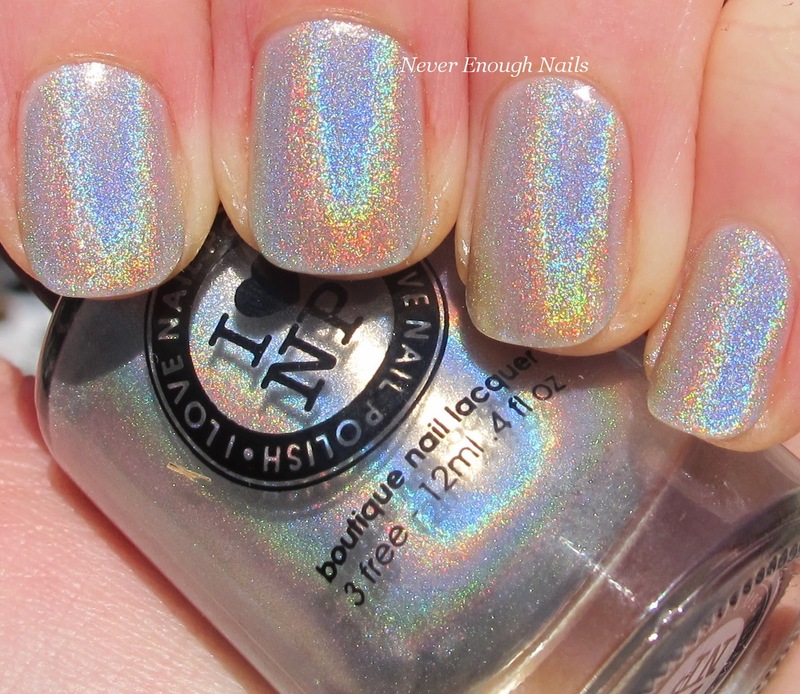 Mega is a bright silver strong linear holo. It is very rainbow-y in the sun, but indoors it's just kind of a shimmery looking silver. The formula was good, pretty easy to apply. This is three coats, I did feel it needed a third coat for full opacity. I didn't have any trouble with streaking or dragging though. I don't use base or top coats when I wear holos. I find they are easier to apply without base coat.